So my taller half’s mum has an amazing fruit and vegetable garden on her small farm and she recently gave us some of the cutest little pumpkins I’ve ever seen. It seemed a crime to cut them up so I opted for baking them whole and stuffing them. I went for a red quinoa based stuffing with paprika, cumin, carrot, spanish onion and parsley as seasoning then topped with some leftover labneh marinated with paprika. On the side I served halloumi fried with lemon slices then topped with chopped parsley. 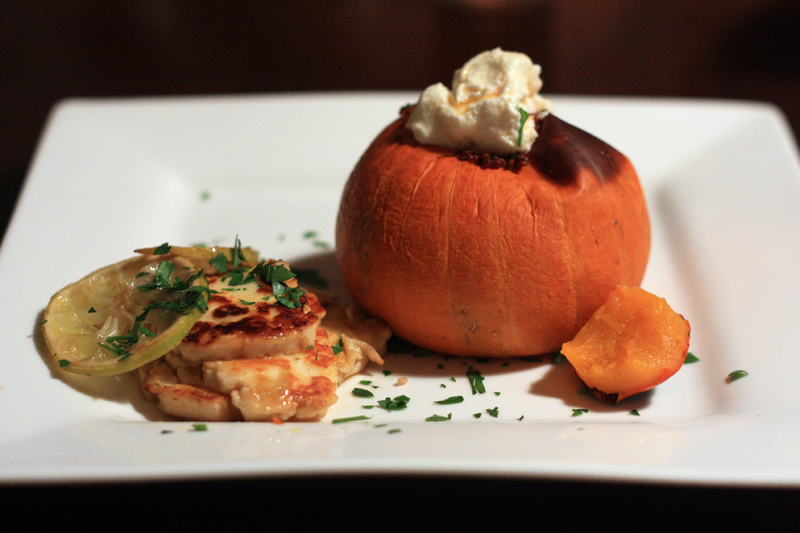 I baked the pumpkin for about 40 minutes on 180ºC (or until the centre is soft – check with a long skewer). Then I cut a small round hole in the top and scooped the seeds out carefully without damaging the pumpkin shell. The skin on these small pumpkins is soft as sweet and totally eatable. I boiled the quinoa in vege stock then mixed through the rest of the ingredients which had been sautéd until just soft. Then I carefully stuffed into the pumpkin topping with the labneh. Bacon would go really well in the quinoa mix if you wanted to add some meat flavour.